Where are the Cincy 4th and Vine Peregrines? Thank you for tuning in to see the Cincy Peregrine falcons! 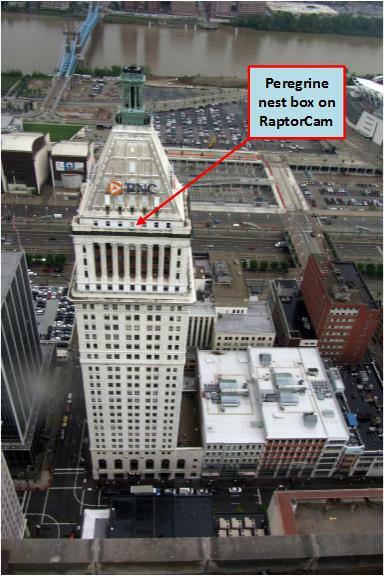 In 2016 the Cincinnati peregrines, which traditionally nested on the 4th and Vine Building, did not appear for the nesting season. They may not be nesting on the 4th and Vine building any longer, but they have been sighted and are alive and well! We would have loved to witness their care of the young, but it’s good to know they are flying free! Check out our blog for details HERE. When active, the live Raptor cam is provided through the generosity of the sponsors you see on this page and is a gift to the people of Cincinnati and the supporters and volunteers of RAPTOR Inc. Thank you to Scott Payne! Why were falcons released in downtown Cincinnati in 1990? Read Program Goals and History to find out! To find out more information about falcons, read Falcon Facts! Watch the video below of the adult peregrine falcon feeding the chicks in the nestbox in 2014.